A day(ish) late on my first weekly post! Eek. I was pulled in immediately. Lucy Snowe is living with her godmother, Ms. Bretton, when little six-year-old Polly arrives. Polly's a little bit of a brat and it's pretty obvious that she is downright spoiled. Temporarily staying with them since her father isn't well, she is drawn to Graham, the sixteen-year-old son of Ms. Bretton. Teasing her and treating her like a little sister, Polly becomes distressed when his attention is not on her, and almost to the point where I felt uncomfortable by her reaction, even though it seems innocent enough. I was getting a little annoyed with Polly at this point, though. When Polly eventually returns to her father, the focus circles back to Lucy Snowe. I was pleased about this because I didn't feel as if I knew her, even though she had been narrating the entire time. After a few years, and distanced from Ms. Bretton, Graham, and Polly, Lucy's prospects for work are slim. She settles with an elderly, ill, and kind woman, Miss Marchmont, who shares her sad love story one night and then passes away, leaving Lucy jobless again. Yet another sad moment for Lucy as Miss Marchmont promised her the night she passed that she would do something nice for Lucy should anything happen to her, help her with finances and such - but she dies that same night, so she obviously didn't have a chance to change her will or anything! Gah! I felt horrible for Lucy. True to Lucy's character, though, she accepts her final wages and moves on without saying a word about the deathbed promise. Lucy is again back to what looks like a sad and lonely life. And where will she work? For someone who once had a lot of money, it's an unfortunate predicament for her to be in. Argh--I had completely intended to join in this readalong but I've gotten so distracted by too many choices. Sounds like maybe I need to try to catch up! Hope you enjoy this - I'd participate but want to keep reading my Christmas haul (to make room for the Easter haul lol). Will be following progress though! It does sound like a good book! I already have it on my Victorian reading challenge list, but I don't have a copy yet. The Miss Marchmont thing was really frustrating. I'm enjoying this too, looking forward to where it might go! I've been reading this book too and also loving it. I'm curious to see if any of these early characters pop back up later as there is so much about them at the beginning. I liked this book when I started it last year, but ended up abandoning it somewhere in the middle. I can't remember why exactly. I hope you like it! 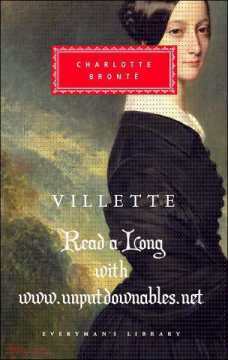 I wish I'd known about this read along -- I've always wanted to read Villette. I'm looking forward to your comments! I loathed Jane Eyre.. so I am not keen to pick up another Charlotte Bronte book... although, will keep an eye on your posts and see what you think, I may change my mind. I just scanned your post because I really want to read this book during my classic phase this year. I will be interested in coming back to these when I am have finished the book! Lisa - You definitely should join! I'm really enjoying this one so far! samstillreading - Good luck with your Christmas haul! I'm still struggling to get through mine as well - yikes! Trish - I ended up downloading it on my Nook Color and have started reading away. I hope you like it! Peppermint Ph.D. - Yay! We have don't a read-a-long together since The Historian! Elizabeth - I'm guessing bratty little Polly is going to show back up. Sigh - I just hope she's a bit more mature. Kim (Sophisticated Dorkiness) - So far, I'm really enjoying it; I'm interested to see what happens when I get to the same point you're referencing. I wonder if I'll get annoyed and put it down? Connolly-Ahern (col Reads - You can still join! It's only the second week so you're not behind by much, and quite honestly, it's easy reading so it would be quick for you to catch up, too! Zibilee at Raging Bibliomania - Do scan since it will contain spoilers! And I hope you enjoy it when you read it later this year - I look forward to your thoughts! Julie @ Knitting and Sundries - You should join Wallace's read-a-long! We're only starting week two on Thursday and it's such a good read so far! I so wish I had time to do this readalong! I just finished Jane Eyre and would love to be reading more Bronte. I'm glad you're enjoying Villette so far! I've really been enjoying all of the posts about this one. I've only read Jane Eyre by here and would love to read this one. I will look forward to all of the updates. Excellent book to read-a-long with. I'm glad you're enjoying it too. I'm a Bronte fan.